Full size Human Skeletons are available, to order, in just about any pose. The pictures shown here are examples in both bronze and steel. Each piece is a totally unique creation. Please allow 3 months for your full size skeleton sculpture to be completed. 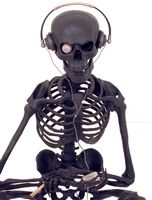 Click here to request a quote for a full size skeleton sculpture. 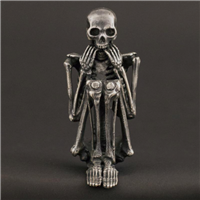 A full Size Skeleton in blackened Stainless Steel. He is an original, one of a kind sculpture. He was our first full size skeleton in steel. Full size Human Skeletons are available to order in just about any pose. Waiting times will vary according to the complexity of the design. A self portrait depicting a cluster headache. A full size skeleton bust ripping his head open. Limited Edition Sculpture in Bronze. Click here if you would like further information on Clustered. Limited Edition Sculpture in Steel. 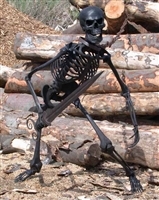 A full size Skeleton in blackened bronze. Each piece is a totally unique creation. Noose included. Please allow 3 months for completion of your full size skeleton sculpture. This is Full Throttle, a rather unusual coffee table and our first piece of furniture. Full size skeleton busts, one being strangled by the other. Bronze skeletons on a brushed steel base. Limited edition of just three sculptures in bronze. We currently have one of these tables available. Click here if you would like further information on this sculpture.. He is listening to a custom made eyepod and smoking a cigarette. His skull holds a single "real feel" Silicon prosthetic eye. The headphones are made in Steel, Copper and Leather. The cigarette is Mammoth Ivory with rusty wire-wool tobacco. His other eye is trapped in the centre of the control dial of his eyepod. His first generation eyepod is made in ebony and silver with a blued steel screen. A full size Skeleton in darkened bronze. He is holding the silvered bronze skull of a child. Waiting times will vary according to the complexity of the design. Please allow 3 months for your full size skeleton to be completed. Full size bronze skeleton breathing in his toxic world. The wanton disregard for the well being of our planet has left wide areas polluted and poisoned. Around the drum we have sketched out the continents in blisters and stains with mankind sitting on top, his bones melting.The figure represents humanity breathing in the toxic world he has created. A reflection on how we view our lives. Nailed It is a contemporary take on a most iconic image, he is twisting and tearing the iron nail out of the oak cross to take his very last selfie on his shattered phone.